The coin was available for purchase from the U.S. Mint from January 2, 1998, through December 31, 1998. 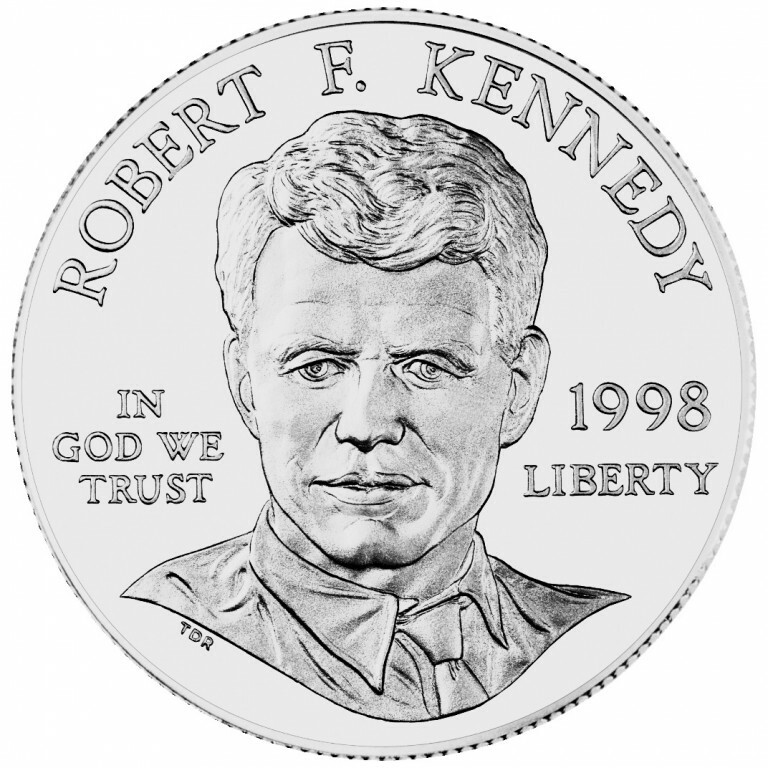 The coin was authorized to commemorate the life and work of Robert F. Kennedy, former Senator and Attorney General of the United States. Robert F. Kennedy’s life story is one of America’s most enduring tales of political service. Born to Rose and Joseph Kennedy in 1925, Robert F. Kennedy attended Harvard University to study government and politics. He left before graduating to serve in the Navy during World War II and became a lieutenant. After the war, he returned to get his B.A. and later earned a law degree from the University of Virginia. He joined the U.S. Department of Justice in 1951, but resigned a year later to run the successful Senate campaign for his brother, John. Later, he managed his brother’s successful Presidential campaign and was named U.S. Attorney General. From 1960 to 1964, Robert F. Kennedy served as Attorney General, attempting to ensure that black Americans had the right to vote, to attend school, and to use public accommodations. Soon after his brother was assassinated in 1963, Kennedy resigned from President Lyndon Johnson’s cabinet and ran successfully for the U.S. Senate. In 1968, he was running for President and had just won the California primary when he was killed at the age of 42 on June 4, 1968. The obverse of the 1998 Robert F. Kennedy Commemorative Silver Dollar bears an especially realistic engraving of Robert F. Kennedy. The sculptor/engraver worked with Kennedy’s widow, Ethel, to perfect the depiction of her late husband. The reverse shows the Seal of the Department of Justice, where Kennedy worked as Attorney General to advance civil rights for all Americans, and the Seal of the United States Senate, where he was serving when he was assassinated. The coin was authorized on September 29, 1994. A portion of the proceeds from each coin sold was authorized to be paid for the purpose of improving the endowment of the Robert F. Kennedy Memorial. 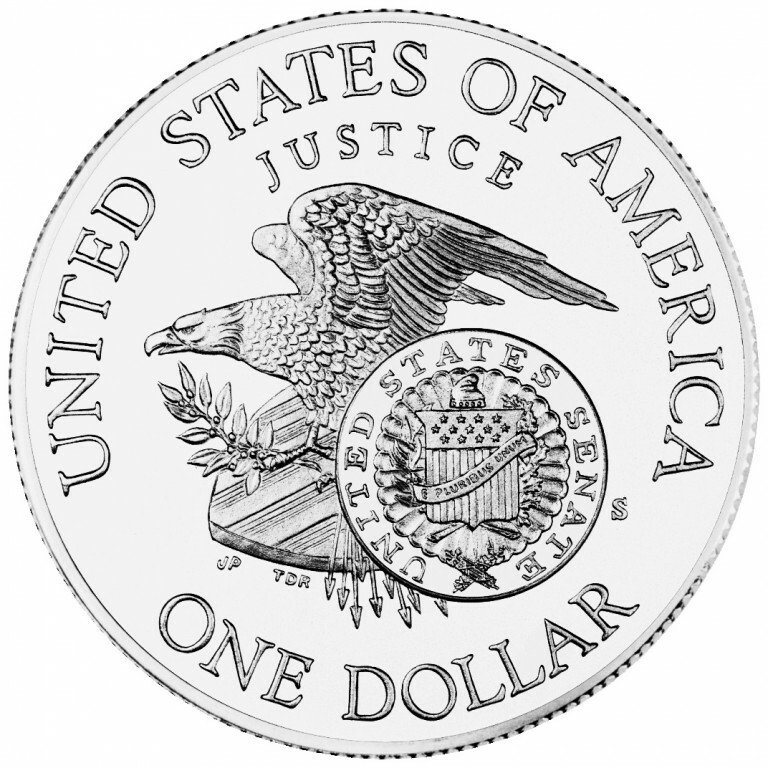 The coin depicts two emblems: the Seal of the Department of Justice; and the Seal of the United States Senate.